Israeli forces resumed spraying pesticides on Palestinian farmlands, along the border with Israel in the southern Gaza Strip Wednesday morning, April 5, according to Gisha, an Israeli NGO that aims to protect the freedom of movement of Palestinians, especially residents of Gaza. Eyewitnesses told Gisha agency that Israeli planes were circling low in the airspace above eastern Khan Yunis in the morning, starting at 6 am, when they began spraying pesticides on farmlands near the Palestinian side of the “buffer zone,” causing fear among farmers that their crops would be damaged, as has been the case in the past. The sprayings are the first reported since January of this year. The Palestinian Ministry of Agriculture in the Gaza Strip is currently assessing damage to the crops of local farmers. Riad Salim Al-Nasser is a farmer in Gaza. He rents 70 dunams (roughly 17 acres) of land, about 200 meters from Gaza’s perimeter fence, where he grows peppers, watermelons, parsley and other crops. Al-Nasser told Gisha’s field coordinator that at around 8 am he saw two Israeli military tanks approach the fence, and witnessed soldiers igniting a substance that created thick smoke, possibly in order to check the wind direction. At 8:45 he says he saw planes spraying herbicide west of the perimeter fence, that is, within the Strip. Al-Nasser also reported that most of the crops in the area have been recently sown, making them especially susceptible to the herbicide spraying. Other crops had been covered in plastic sheeting and recently uncovered to enjoy the warming weather of the season. He is very concerned by the prospects of further damage to his crops, considering crops were also harmed in the last round of spraying, which took place only months ago. He emphasized that farmers have not been compensated for the damage to their crops. The spraying of herbicides exacts a heavy price on members of Gaza’s farming community, who are among the poorest and most vulnerable in the Strip as it is. Al-Nasser says that the area of his plot closest to Bureij camp is already completely flattened because of previous bouts of spraying and devoid of vegetation. Wael Thabet, director of the Flora Protection Department in the Ministry of Agriculture in Gaza told Gisha that the department received reports about spraying in several areas in the east of the Strip: spanning from Beit Hanoun in the north all the way to Khuza’a, Khan Yunis, in the south. 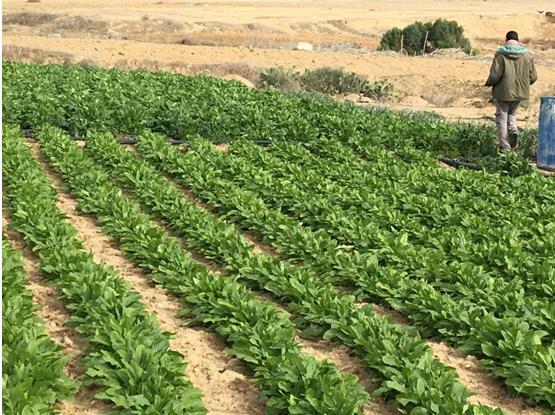 Employees of the Gaza Ministry of Agriculture have collected samples from the sprayed fields and are conducting tests to evaluate the damage caused. The results of their assessments will be available soon. Thabet also emphasized that the reported spraying had taken place west of the perimeter fence, that is, within the Strip. According to the Palestinian Ministry of Agriculture, the spraying conducted during January this year damaged approximately 3,400 dunams (roughly 840 acres) of crops. Responding to a Freedom of Information petition filed by Gisha, the Israeli Ministry of Defense said last September that the spraying takes place only on the Israeli side of the fence, in the security barrier area. Given the extent of the damage deep inside the Strip, this reply is far from satisfactory. The ministry failed to explain why the spraying was carried out, and why the same result could not be achieved using less destructive methods. This recent round of spraying demonstrates that Israeli authorities continue to implement a scorched earth policy in the area near Gaza’s perimeter fence – for no apparent reason and without explanation.